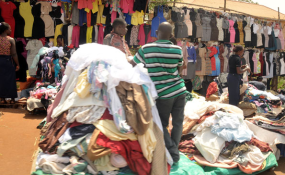 Heaps of second-hand clothes stacked together at a Ugandan Market (file photo). Dodoma — Two days after the US Trade Representative announced that Tanzania, Uganda and Rwanda risk losing access to the American market through the African Growth and Opportunity Act (Agoa) following plans by the East African member states to ban imports of second-hand clothes and shoes, a former Cabinet minister has asked the government to take the issue seriously. The US Trade Representative announced on Tuesday the initiation of an out-of-cycle review of the eligibility of Rwanda, Tanzania and Uganda to receive benefits under the act after concerns that the planned ban will impose significant economic hardship on the US used clothing industry. The launch of the review is in response to a petition filed by the Secondary Materials and Recycled Textiles Association (Smart), which asserts that a March 2016 decision by the East African Community, which includes Rwanda, Tanzania and Uganda, to phase in a ban on imports of used clothing and footwear is imposing significant economic hardship on the US used clothing industry. Having read the article in The Citizen on Thursday, Dr Diodorus Kamala (CCM - Nkenge), said the government needs to take the issue seriously and come up with necessary plan of action. "There is a story in The Citizen today which shows how serious this issue might be. The government needs to come up with relevant measures to protect the economy from the negative outcomes of what might be reached under Agoa," he told the House yesterday during a debate on the 2017 Finance Bill. Dr Kamala, who was minister for East African Cooperation during in the Jakaya Kiwete government, said EAC members have shown "serious" inconsistencies in the implementation of the region's Common External Tariff (CET). It is now viewed that each member country is going its own way, contrary to the CET that requires Tanzania, Kenya, Uganda, Rwanda, Burundi and South Sudan to have a common position with regard to import duties for goods originating from outside the region. Dr Kamala, who is an economist, said for instance, Tanzania is currently promoting the manufacturing of gas cylinders locally and has therefore raised import duty on the products. Yet, some countries in the trading bloc are zero rating import duty on such products. "It means, if Tanzania manufacturers these products in excess, we will have nowhere to sell them within the region since others will be importing the products outside the region at cheaper prices," he said. noting that similar decisions are also true for the iron and steel, textiles, leather and garment industries among others.